Get six quality throwing knives at one low price with this professional-grade throwing knife collection. 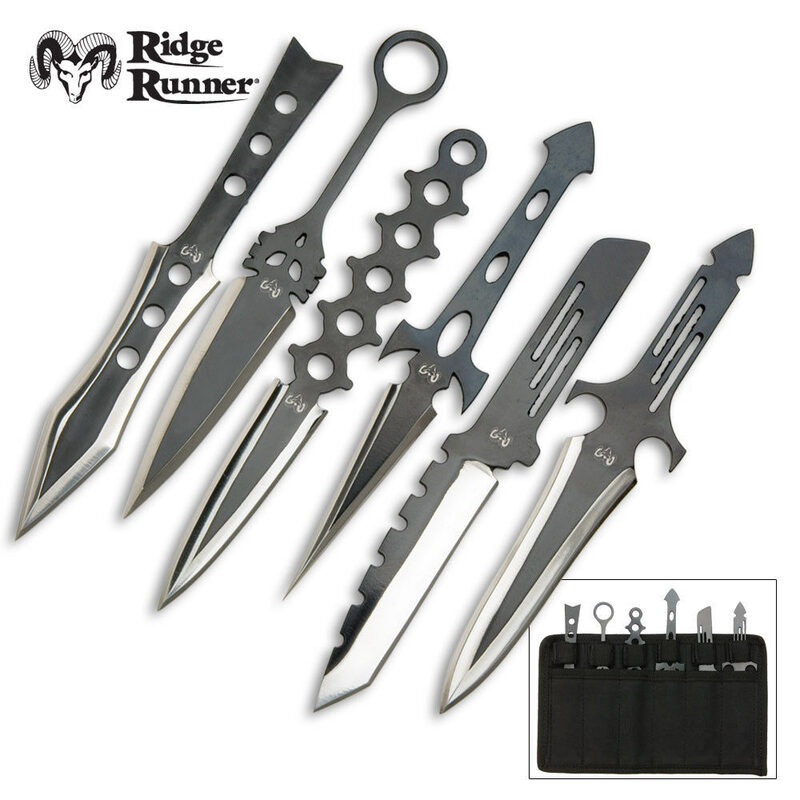 Each of the six throwing knives has sharp edges and points for maximum target penetration with every throw. An attractive, two-tone finish and decorative, exposed handle designs give these throwers plenty of zing. 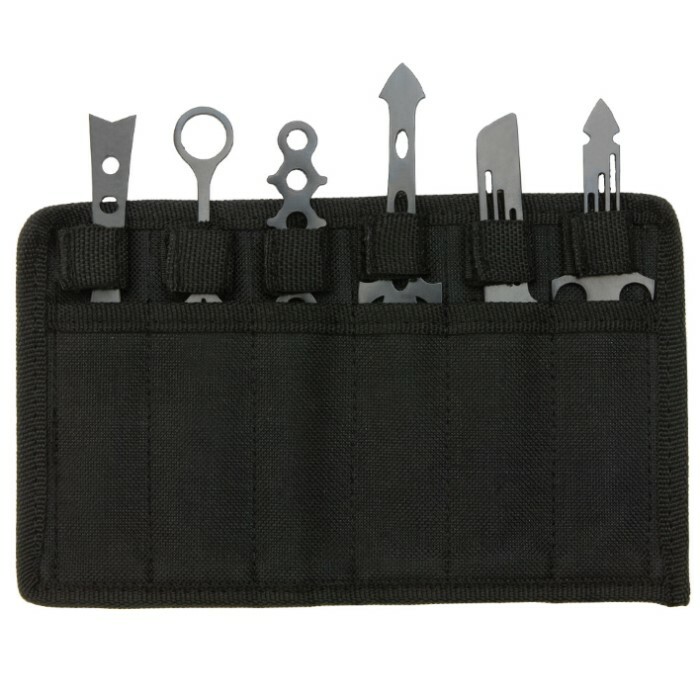 Includes pouch to house all six throwing knives. 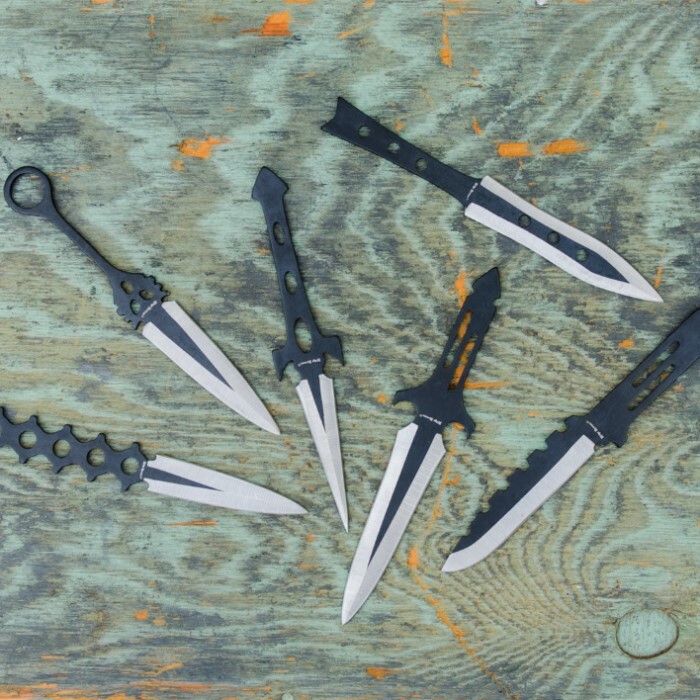 A set of 6 smallish throwing knives that look like perfect fantasy swords. Only one came with a good edge however. The others all sharpened very nicely. Used all of them for a 3 hour session and no issues. Did better after sharpening however. Sheath works well enough, but could have been designed better. But this is better than the $10 price tag. May get another set. People need to read a bit more before buying. Anyways, I have these knives myself and have been using them for about 5 years. Not a single one is broken. If you're wondering how to not break them, it is simple: learn to throw correctly. I throw at a target of wooden pallet blocks with the interior grain being the target. The ground beneath the target is patio brick. Despite all that use, none of mines have broken because I throw them with the right force. Of course these will probably break, much less not stick, if you are not throwing with the right amount of force. Not to mention their cheap price. What did you expect, a titanium throwing knife that goes into the target itself? Just felt like ranting a bit because I know how to properly take care of my knives. If you take care of them properly and learn how to throw them correctly, then they'll last. I've only had one throwing knife ever break on me, and it was from a 12 pack of Ridge Runner Tornado Knives that I had for equally long. Anywho, the size is definitely small, but it is what I expected when I read the description. I still enjoy throwing these since they're not all the same and makes you want to learn how to throw in the different styles available. I wouldn't buy again because I don't need to replace what is not broken. I got a set of these 6 for Christmas and within the first week of using them, 4 had broken. Poor quality. Three of them broke in one day. I got this set of throwing knifes two days ago, and have managed to break three of them in one Sunday afternoon with normal use. These knives were definently smaller than I was thinking. However I am very impressed with their quality. Only reason for the 4 stars is the size. was really wanting at least 7 to 9 inch throwers. These knives are great quality and look super awesome too. they come sharp, but the stingy case could be better, im not using it. but overall the knives are awesome. i will definitely order from budk again! These were awesome. I'm still having fun today with my knives!! !